The Cognac house of Maison Villevert has a long and varied history. The owners and creators not only of Cognac, but other spirits such as Ciroc Vodka and G'Vin Gin, the house boasts over 500 years of know how. It truly is a wonderful example of how years of expertise can be combined with the cutting edge technology of today. Owner, entrepreneur, and cellar master, Jean-Sebastian Robicquet is the brains behind this innovative house. Based in Merpins, Maison Villevert, he's a man who's whole life has been dedicated to Cognac and everything to do with the industry. 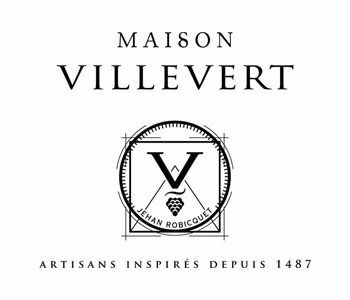 It's necessary to reach far back in time to fully understand the history of Maison Villevert - to the year 1487, to be exact. It was in this year that Jehan Robicquet began distilling the liquid that today we know as Cognac. Indeed, this was a man who was one of the innovators of his time, selling and exporting his wares to the very first fans of Cognac. Today the house is headed by Jean-Sebastian Robicquet - a man who takes his profession very seriously. He's learned his trade through hard graft, with such great names as Hennessy, and more recently, Hine Cognac, with whom he travelled the world as their export and marketing manager. In 2009 he was glad to purchase the house that had been in his family since the 15th century, Maison Villevert. Little did he know that within a short six years, the house would become a true 'spirits empire', boasting such popular products as G'Vine Gine, Ciroc Vodka, and Excellia Tequilla. There is currently no information available about visiting Maison Villevert. Please contact the house directly for further details.